Potatoes are a great go-to side dish for almost any meal. Everyone always loves a good starch. 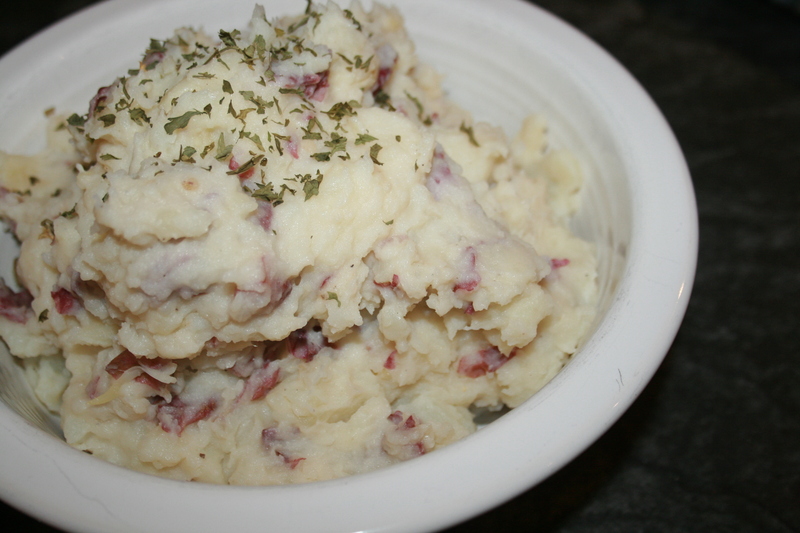 I find that a personal favorite, and crowd pleaser, is garlic smashed potatoes. The first question you are likely asking yourself is, “What’s the difference between mashed and smashed?” Well, the big difference affects both the texture and aesthetic of the dish. When making smashed potatoes, you leave the skin of the potatoes on and then mash, as opposed to peeling them. This adds an extra layer of texture that contradicts the creamy-smooth potatoes, and also a nice bright color (if you use red potatoes). First things first, preheat the oven to 425 degrees F. Take the garlic and slice off the top of the head. Drizzle the garlic with EVOO, wrap in tin foil, and bake in the oven about 30 minutes or until tender and fragrant. Slicing the top off helps the garlic roast better, and makes it easier to remove the cloves from the skin. Clean the potatoes and quarter them. Put potatoes in a pot filled with cold, salted water and bring to a boil. Cook the potatoes until they are fork tender. Drain and put back in the pot (by returning to pot you now have an easy place to mash!). Add the garlic to potatoes and mash. While the potatoes are cooking, heat the butter until it is melted. Add melted butter and milk to the potatoes and mash up together. Sprinkle in salt and pepper to taste. Then actually taste it! The most important part of getting a recipe right is tasting it. Depending on what you like, you may want to add more butter or milk. Garnish with a tad of parsley (optional) and serve!